Divine Mercy for All Ages! 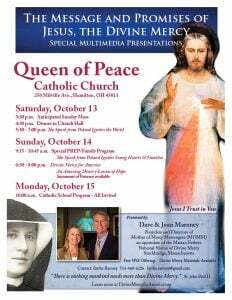 Queen of Peace Catholic parish and school is taking full advantage of MOMM’s variety of outstanding multimedia presentations and experience to reach out to all ages and segments of the parish community. 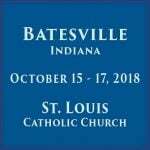 A visit from Dave and Joan Maroney presents a rare opportunity to evangelize and renew everyone including children, families, the poorly catechized, the most devout, and all in between. Saturday, October 13, 2018 Time to be announced. Sunday, October 14, 2018 Time to be announced. All are welcome. 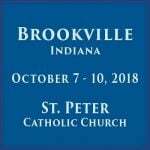 This powerful presentation targeted towards adults and late teens chronicles the amazing story of Poland’s journey from darkness to light by means of Divine Mercy. Monday, October 15 – Catholic School Presentations Time to be announced. All are welcome to these presentations which are similar to “The Spark from Poland Ignites the World” but is geared toward the age group present. The program concludes with the recitation of the Chaplet of Divine Mercy. Each classroom will be given a FREE 11 x 14 Divine Mercy Image. Each student will receive a BLESSED 5 x 7 Divine Mercy Image to take home. Accented with a blank ribbon, this image is designed for the student to fill in “Jesus, I Trust in You” on the bottom of the card, allowing them to make a personal commitment to trust in the Lord.